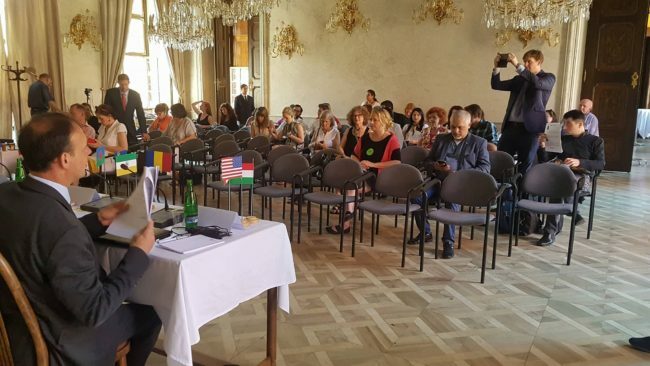 The 5th co-ordination meeting between international intergovernmental organisations organized by the AD HOC COMMITTEE OF EXPERTS ON ROMA AND TRAVELER ISSUES (CAHROM) in cooperation with the Governmental Office for Roma Affairs of the Czech Republic took place on 31 May in Prague. It was supported by ERGO member Slovo 21 and was organized during the International Roma Festival Khamoro. Representatives of the Council of Europe, the Council of Europe Development Bank, the European Commission, the Fundamental Rights Agency, OSCE/ODIHR, UNDP, UNICEF, World Bank, representatives of national governments and relevant actors involved in the Roma issues participated in the meeting. ERGO Director Jamen Gabriela Hrabanova presented the reference paper on antigypsyismand the “Roma Civil Monitor”, a project on shadow monitoring and capacity building run by Central European University together with the European Roma Rights Centre, Roma Education Fund, Fundacion Secretariado Gitano and ERGO Network. The CAHROM took note of the reference paper and shared it with all CAHROM members. Jamen appealed to the government representatives to tackle systemic antigypsyism in their countries and to make a special effort to include combatting antigypsyism into their national strategies. This appeal was even more relevant as the CAHROM set up an international Task Force on Anti-Gypsyism under the Czech Chairmanship of the Committee of Ministers of the Council of Europe.